Animal Magnetism is aptly titled. The book’s two strongest points are the appealing critters its animal-loving heroine Lilah Young cares for, and the strong sexual chemistry between Lilah and ex-military pilot Brady Miller. Author Jill Shalvis deftly juggles “cute” and “hot”—not a bad combination. Set in the Bitterroot mountain range in Idaho, Animal Magnetism features a classic pair of lovers. Lilah Young is feisty, independent, and beloved by residents of the small town of Sunshine. She runs the local kennel and is the de facto humane society, rescuing animals of all shapes, sizes, and temperaments. She is secretly studying to be a veterinarian and is chronically short of funds. Her one venture outside her small town ended in a broken heart; however, she is still interested in falling in love. Brady Miller grew up tough. Shunted among multiple foster homes, he finally landed in Sunshine in the care of a tough, but caring cowboy who took in Brady and two younger boys. Now he is a pilot-for-hire whose assignments take him to dangerous places no one else wants to go. The epitome of the proverbial rolling stone since his foster father died, he has no home, no attachments, and nothing to tie him down, and that’s the way Brady wants his life to stay. The only reason Brady comes back to Sunshine is because his two foster brothers ask him for a favor: repair the helicopter they want to use for their business, the Belle Haven animal center, which combines veterinary services with search-and-rescue dog training. Lilah and Brady meet in a delightful opening scene. Lilah is transporting a pet duck, two puppies and a potbellied piglet. Distracted by the unruly duck, she rear-ends Brady’s pickup truck. The attraction between them begins to simmer immediately, highlighted by sassy banter and rambunctious animals. Abigail the duck is a character who should be given more page-time. In fact, animals play major supporting roles throughout the book. When Lilah foists a rescued dog named Twinkles on tough guy Brady, he predictably protests and then falls for the little creature. His attempts to discipline the dog entertain both the reader and the other characters in the book. One of the emotional breakthroughs between Lilah and Brady is triggered by a three-legged cat. Brady displays his heroic side when Lilah gets into trouble while trying to trap a mama raccoon and her babies before a local rancher shoots them. This is a story tailor-made for animal lovers. The heat generated between Lilah and Brady warms the entire novel. Their encounters are lively and humorous. Their love scenes are spicy, passionate, and believable. The only drawback is that they so clearly belong together that there is a certain lack of tension. It seems obvious that Brady can live in Sunshine while still working as a pilot, so the reader is never in doubt that he will figure that out. Lilah has a tougher job, trying not to scare him off by showing the depth of her feelings as he works through his simple dilemma. 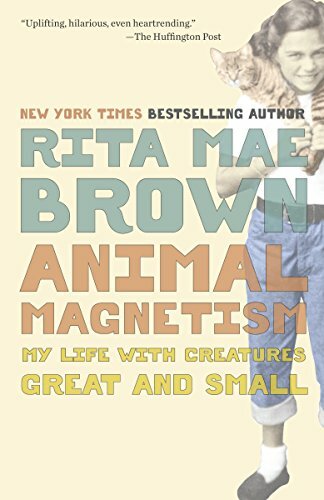 The lack of strong conflict makes Animal Magnetism a pleasant, fun read but not always a compelling one. Fortunately, the pleasures of vivid, sympathetic characters and heartwarming animals make up for the somewhat thin plot. It looks as though Ms. Shalvis is setting things up for sequels featuring Brady’s two younger foster brothers Dell and Adam, so the reader may have the chance to enjoy the antics of Abigail the duck once again.